Computer Science Quiz on Java (Ch 1 - Ch 7), created by Heather Williams on 06/23/2018. Which of the following statements opens a file named MyFile.txt and allows you to append data to its existing contents? 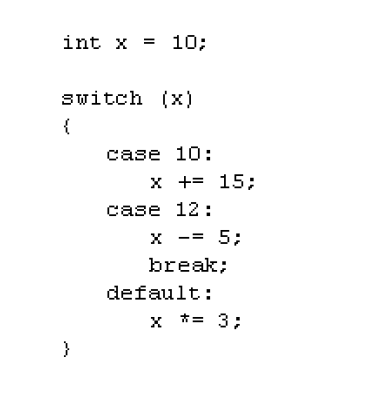 What will be the value of x after the following code is executed? 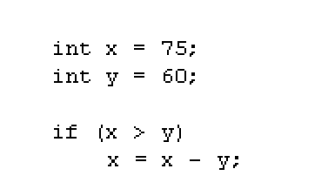 Which of the following strings could be passed to the DecimalFormat constructor to display 12.78 as 12.8%? Given the following statement, which statement will write the string "Calvin" to the file DiskFile.txt? 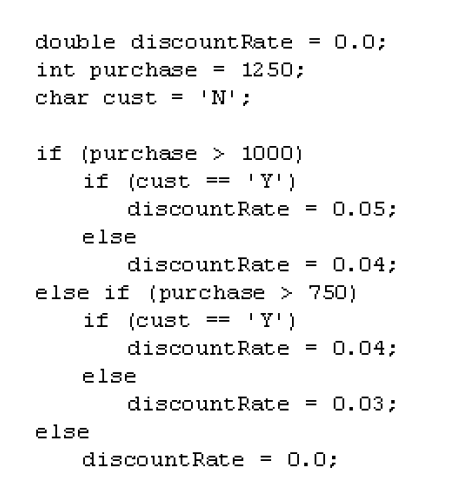 What would be the value of discountRate after the following statements are executed? The ________ is ideal in situations where the exact number of iterations is known. The variable x will contain the values 0 through 5. 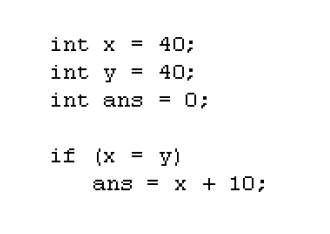 An array of 6 values, all initialized to 0 and referenced by the variable x, will be created. A compiler error will occur. An array of 6 values, ranging from 0 through 5 and referenced by the variable x, will be created. What will be displayed when the following code is executed? 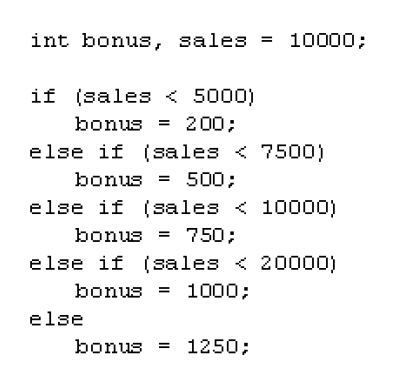 What will be the value of bonus after the following code is executed? no statements or blocks are executed. the statement or block following the else is executed. the first statement or block is executed. all statements or blocks are executed. Assume that inputFile references a Scanner object that was used to open a file. Which of the following while loops shows the correct way to read data from the file until the end of the file is reached? A ________ is a boolean variable that signals when some condition exists in the program. in order to avoid having stale data. because it should be defined in another class. in order to keep it current. must be re-compiled for each different machine it is run on. cannot run on computers with different operating systems. a set of double quotes. inside the parentheses of a method header. the method in which they are defined. inside the class, but not inside any method. What will be returned from the method, if the following is the method header? be automatically initialized with 0. ________ operators are used to determine whether a specific relationship exists between two values. 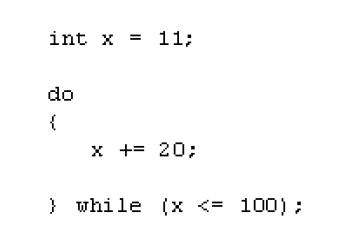 Using a counter-controlled while loop, write Java code to compute the sum of the integers from 1 to 100, inclusively, and output that result to the console. You will declare the integer variable num to count the number of executions (in the counter-controlled loop) and initialize it to 1. You will also declare the integer variable sum to store your computation result and initialize it to 0. Be sure to print your result to the console. 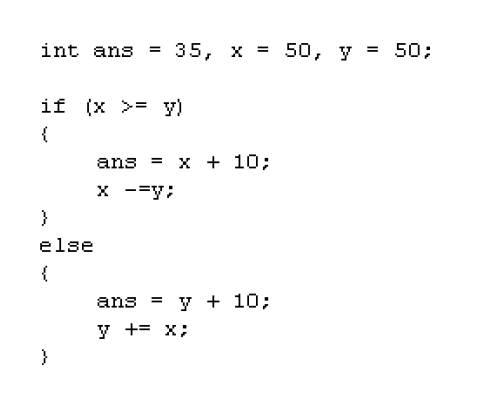 How many times will the following for loop be executed? This type of loop will always be executed at least once. know exactly how many values there are to total. set all variables to zero. read all the values into main memory. set the accumulator variable to an initial value, usually zero. Class objects normally have ________ that perform useful operations on their data, but primitive variables do not. 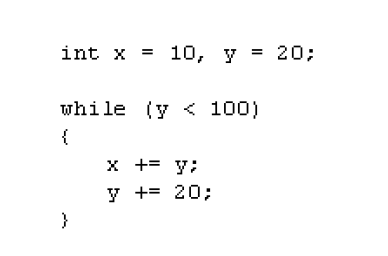 A for loop normally performs which of these steps? In UML diagrams, what symbol indicates that a member is public? 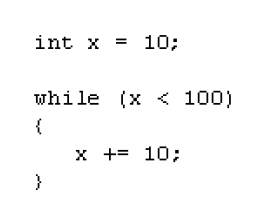 How many times will the following do-while loop be executed? may have zero or more parameter variables. may have only one parameter variables. What is the result of the following expression? The value variable will contain the lowest value in the numbers array. The value variable will contain the average of all the values in the numbers array. The value variable will contain the sum of all the values in the numbers array. The value variable will contain the highest value in the numbers array. A loop that executes as long as a particular condition exists is called a(n) ________ loop. If str1 and str2 are both String objects, which of the following expressions will correctly determine whether or not they are equal? What will be displayed after the following code has been executed? The code contains an error and will not compile. creates an object in memory. creates a new Java byte code file. creates a new variable in memory. Which of the following expressions could be used to perform a case-insensitive comparison of two String objects named str1 and str2? A UML diagram uses the ________ symbol to indicate that a member is private. Which of the following is not a rule that must be followed when naming identifiers? Uppercase and lowercase characters are distinct. The first character must be one of the letters a-z, A-Z, an underscore or a dollar sign. After the first character, you may use the letters a-z, A-Z, an underscore, a dollar sign, or digits 0-9.
a set of instructions that enable the computer to solve a problem or perform a task. the return type, the method name, and the parameter list. the return type and the method name. the method name and the parameter list. the size of the method in memory. What does the following UML diagram entry mean? 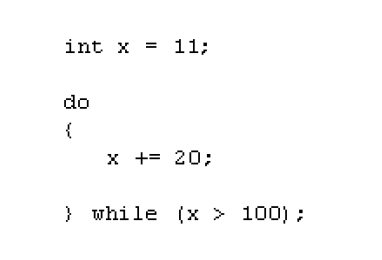 Using a for loop, write Java code that prints out all multiples of 5 from 0 to 100, inclusively, to the console. A loop that repeats a specific number of times is known as a(n) ________ loop. What will be the values of ans, x, and y after the following statements are executed? What would be the value of x after the following statements were executed? When working with the PrintWriter class, which of the following import statements should you have near the top of your program? This is a named storage location in the computer's memory. use an assignment statement to make object2 a copy of object1. use the copy method that is a part of the Java API. write a method for the class that will make a field by field copy of object1 data members into object2 data members. use the default constructor to create object2 with object1 data members. 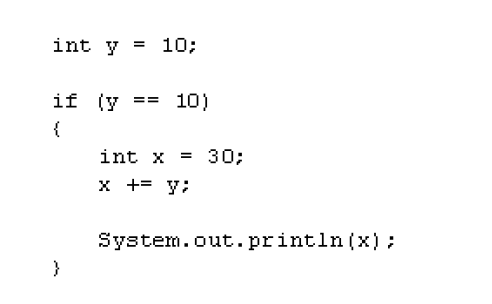 If you wish to use the System.out.printf method to print a string argument, use the ________ format specifier. in brackets, before the field's data type. after the access specifier and field's data type. after the access specifier and before the field's data type. Character literals are enclosed in ________, and string literals are enclosed in ________. Which of the following expressions determines whether the char variable chrA is not equal to the letter 'A'? the things a class is responsible for knowing. the things a class is responsible for doing. Words that have a special meaning in the programming language. Rules that must be followed when writing a program. Symbols or words that perform operations. Which of the following statements opens a file named MyFile.txt and allows you to read data from it? 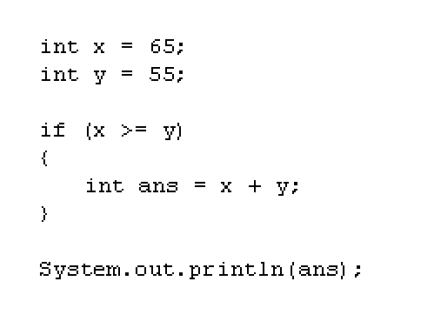 What is the value of ans after the following code has been executed? The ________ statement is used to create a decision structure, which allows a program to have more than one path of execution. arranges elements in ascending order. is rarely used with arrays. arranges elements in descending order. is used to locate a specific item in a larger collection of data. having two or more methods with the same name, but different signatures. 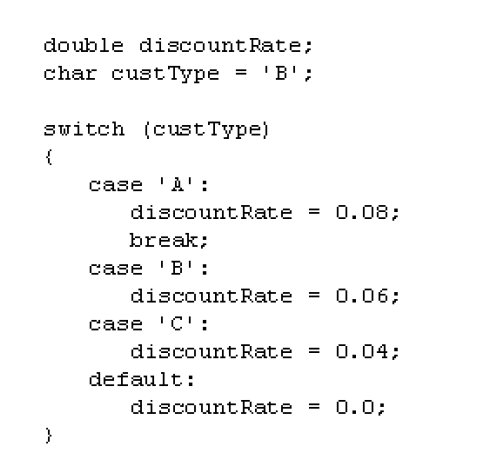 having two or more methods with the same signature. writing a method that does too much processing. always has an access specifier of private. has return type of void. has the same name as the class. using the public access specifier on the class methods. using the private access specifier on the class methods. using the private access specifier on the class fields. using the private access specifier on the class definition. Which of the following expressions will determine whether x is less than or equal to y? Which of the following statements determines whether temp is within the range of 0 through 100? All the values in the array will be initialized to 10.0. All the values in the array, except the first, will be set to 10.0. The code contains a syntax error and will not compile. removes the object from memory. performs initialization or setup operations. returns an object of the class. Assuming that inputFile references a Scanner object that was used to open a file, which of the following statements will read an int from the file? It establishes a connection with a file named filename. It allows the user to enter the name of the file that data will to be written to. Nothing. The code contains a syntax error. It writes to a file named filename. The ________ loop is ideal in situations where you always want the loop to iterate at least once. A ________ is a value that signals when the end of a list of values has been reached. ________ is the term for the relationship created by object aggregation. Which Scanner class method reads a String? This statement tells the compiler where to find the JOptionPane class and makes it available to your program. 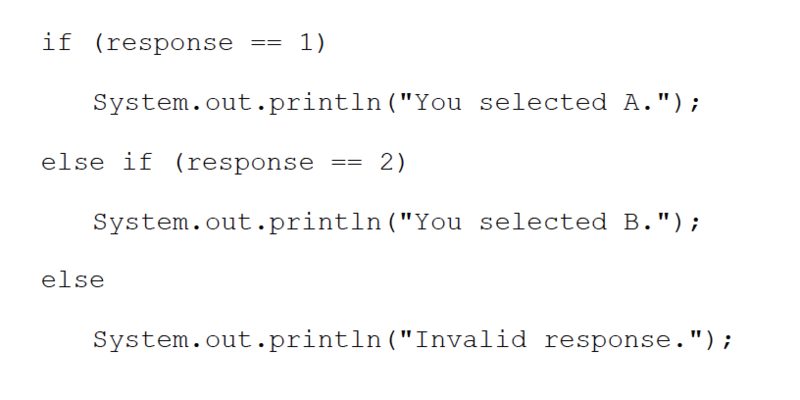 Which of the following is not a valid Java comment?